Get your town’s resources lined up to improve healthcare quality! Players take on the role of organizations working to implement health quality initiatives among payers, providers, employers, and local communities. Build up resources and craft narratives to reach key milestones and meet your goals. Find the path that yields the care your community needs, allocate your resources wisely, and win! Players race to fulfill the care needs of two Target Populations in their community by enacting health care Improvements. Every round players compete and collaborate to divide a fixed pool of Resources equitably, and then use those Resources to work towards their Improvements by completing Milestones that stand in their way. The first player to improve health care in her community enough to meet the care needs of two of her Target Populations is the winner! Players must be creative enough to craft narratives about their Improvements while being analytical enough to find the most efficient path to victory. Pathways for Quality supports Aligning Forces for Quality, the Robert Wood Johnson Foundation’s signature effort to lift the overall quality and value of health care in targeted communities, reduce racial and ethnic disparities, and provide models for national reform. 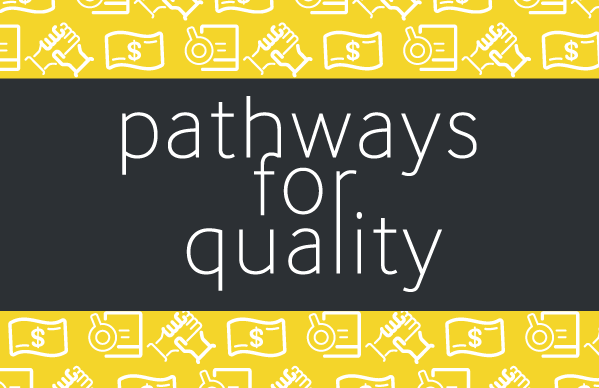 Pathways for Quality was designed and produced in collaboration with Digital Mill, and made possible with support from the Robert Wood Johnson Foundation (RWJF). During the Resource Phase do I have to split the Resources evenly? No! Feel free to divide them however you desire! You can even split them into a pile of 0 cards and a pile of all the cards (of course, you’ll be stuck with the pile of no cards). If you can make one pile have fewer resources, but the resources your opponent needs, then you can come out ahead! I want to use the ability on the Capital card in my hand, but I don’t want to discard it. My Target Populations’ care icons match those on the Improvements I was dealt—do I win? Not unless you’ve completed all the Milestones on top of those Improvements! Once you have removed all the Milestones from on top of the Improvements that match the Target Population cards you can discard those Improvements to meet the needs of that Target Population. Only once you’ve met the needs of 2 Target Population cards is the game over!